Home > Caring For Animals > What Does a Gamekeeper Do? Just to say the word ‘Gamekeeper’ conjures up (for me anyway!) an unforgettable image of Billy Connolly as ghillie to Queen Victoria, John Brown, in the film called Mrs Brown. Away from the fictional characters: what does today’s real-life Gamekeeper do? 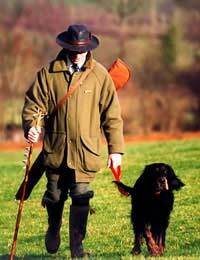 A dictionary definition states that a gamekeeper is: ‘A person employed to take care of game and wildlife, as on an estate.’ These days there are a few thousand full-time, and about the same number part-time, gamekeepers employed by shooting syndicates (as well as those employed by traditional private country estates). The basic role remains relatively unchanged since its beginnings; when the protection of deer was the main priority of a gamekeeper. Gamekeepers make sure there is enough game to shoot; but there’s much more to it than that. They need exceptionally good skills of organization, demonstrate a helpful, knowledgeable, but discreet attitude towards clients and excellent gunmanship. Whatever the weather or time of year, the work of a gamekeeper revolves around outdoor pursuits. Be it wet, cold, windy or foggy, they’re all working days: that often start even before the dawn chorus…In spring and early summer, gamekeepers in some areas are kept busy with the additional work of rearing birds such as pheasant and partridge (poults) to be released on the land in their care during July-August. Tractor/quad bike driving, repairs to equipment, clearing ground of heather, building fences, gun-dog training and the inevitable record-keeping are among the extensive list of jobs expected of a gamekeeper. Poachers continue to flout the law in more remote areas. In these circumstances, the gamekeeper’s extensive knowledge of every area of the habitat where he works (and the health of animals on it) is crucial. Observation of any sudden unexpected changes in the animals’ behaviour, or damage to livestock fencing, hedges or other boundaries and the discovery of traps or trespasses are dealt with accordingly. Gamekeepers need to be physically fit, hardy characters! An in-depth understanding of nature and conservation is a necessity, too. They must be happy to work alone for long periods of time; but also be able to work as part of a team. Fair-weather fellows need not apply…Employers may provide the essential all-weather clothing, boots and appropriate gloves, a suitable vehicle, mobile phone, guns, lifejacket (where appropriate) and further specialist equipment needed for the work involved.As the gamekeeper spends most of his time working alone in private grounds (which can cover hundreds of acres) it is important that stringent safety checks are in place and reliable communication tools available. Safety procedures in handling power saws, farm machinery and equipment should be current and backup to cover emergencies should be foolproof. Membership of professional shooting and conservation associations, CRB checks, first-aid training and extensive experience/qualifications in game keeping are among the bare essentials for this career. Vacancies are few and far between; but for those who pursue the title of gamekeeper an extraordinary life awaits.